Holidays to Mozambique up to -70% off To take advantage of these offers, join now for free! Mozambique boasts a long stretch of coastline with turquoise waters, bustling with shoals of fish and coral reefs. With a rich history including colonial architecture, it has a trendy capital, Maputo, which boasts a vibrant and busy nightlife. Mozambique is seen as an up and coming safari destination, containing the much-praised Gorongosa National Park which is seen as one of the most bio-diverse places in the world - it's known as the “Serengeti of the South” for the prides of lions that stalk among its savannas. The Maputo Elephant Reserve lies near the capital and is home to around 300 elephants while Limpopo National Park forms part of the Great Limpopo Transfrontier Park, which spans three countries to make one of Africa's largest wildlife areas. Our packages allow you to experience Mozambique on an incredible 2-week adventure, including exploring the full range of safari and marine wildlife that is on offer. Mozambique is home to two archipelagos, full of tiny private atolls for you to set your flag. The Bazaruto Archipelago, which lies offshore from Vilanculos, is made up of several postcard islands with long stretches of perfect sand and containing coral reefs teeming with fish. Here you can go snorkelling and diving to your heart's content. In the north, the Quirimbas Archipelago is one of Africa’s best-kept secrets, with 32 coral islands surrounded by the beautiful turquoise sea. For first-time snorkelers, as well as for the veterans among you, it's sure to be an awe-inspiring experience with marine wildlife such as turtles, dugongs, whale sharks, manta rays, and humpback whales. Mozambique's capital, Maputo, boasts a faded Art-Deco charm reminiscent of the Portuguese colonists who arrived in the 17th century and founded the city. 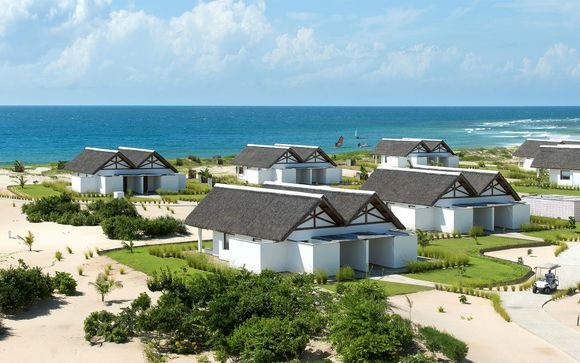 A cosmopolitan, trendy setting, it perfectly culminates the extremely varied blend of cultures and languages that make up Mozambique, which has over 40 official languages. Booking a last-minute holiday to Mozambique gives you the opportunity to enjoy the best of all worlds, with no shortage of top restaurants and bars in the capital for you to enjoy. Its vibrant and busy nightlife with a host of dining options has something to offer every traveller. Voyage Privé provide a selection of luxury hotels for you to choose from, ensuring your stay in Maputo is comfortable and opulent. In Mozambique you truly have the opportunity to do it all. So to keep up to date on exclusive offers and discounts as they become available, sign up to Voyage Privé and stay in the know regarding our handpicked offers and last-minute deals on travel.